jimmydumps/sunnyjimmy: The Trick is to See. Clearly. Always. The Trick is to See. Clearly. Always. I have been reading George Orwell lately. Recently, seeing the great film "Icarus," about bike racing, doping, the Olympics and Putin's murderous, lying regime sent me back to Orwell. Of course, I read "Animal Farm," and "1984" back in high school. "1984," was an especially mind-blowing experience. I would say both of those books were "foundational" for me. Opened my eyes. Changed the way I saw the world, politics, nation-states, propaganda, the human story, forever. I recently finished Christopher Hitchens' superb "Why Orwell Matters," a clear-eyed, concise overview of Orwell; his thought, his character, and the reasons why he is such a relevant figure today. This led me to the original sources. I wanted to delve a bit into Orwell directly. The two books I just recently finished were "Down and Out in Paris and London," and "Homage to Catalonia." The first one is about being poor on the streets of Paris and London during the early 1930's. Orwell lived on the streets. You really get a vivid picture of a life of as street person. Orwell didn't just do an anthropological study, he actually, really, lived the life. It is such a vivid, human picture. Powerful. Clear-eyed. Same with "Homage.." Orwell volunteered to fight in the Spanish Civil War. He was a fierce anti-fascist (as well as being suspicious of Stalin's brand of Communism, rampant, kleptocratic capitalism, and authoritarian governments of all stripes). This is "journalism" of the highest order. But in this case, the journalist is in the trenches, dodging bullets, picking sides, but, at the same time, clearly depicting all sides of the conflict, telling us what he saw first-hand in exacting detail, trying to parse the daily events, signs and wonders. What have I learned? Orwell really was a great writer. He is so human. You really come to appreciate a man striving to always see clearly. Not an easy thing to do. But Orwell does it with humility and grace. He was someone with great empathy for human beings in all their complexity. Orwell depicts some difficult human conditions, but he does it with such common sense, such clarity, such deep empathy. It can't help but deepen the reader's heart and head. Great human being, great books, totally enriching. 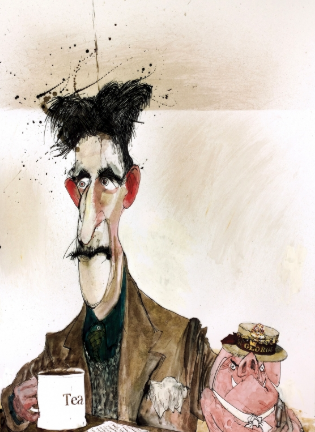 Orwell doesn't make anything easy, he shows us the complexity, the multiplicity of the human condition, but he does leave the reader with a deep glimmer of light, and an abiding faith in the common decency of human beings. The trick is to see. Clearly. Always. Something to keep in mind in the roiling madness of the day. Why are We So Anxious & Depressed?! A Copy of a Copy of a Copy of Myself. Why is the Easiest Stuff the Hardest?! We are Left with the Odiferous Stink! A Very Gruesome and Painful Proctological Exam! Bucephalus Bikes - A Gem of a Bicycle Shop! Holy Shite... Let It Come Down! The Dim Bulb Is Short-Circuiting! A Really, Really Bad Idea! The GOP is a Broken Vessel! Extremely Weird, Mildly Weird, But Always Weird. We are in for a Bumpy Ride!